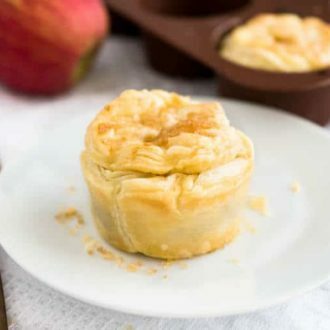 Mini Apple Pies with Dulce de Leche - you only need 4 ingredients to make these perfect bites! The gooey, flavorful filling makes these toffee apple pies a family favorite. Pee, core and roughly chop the apples. Place them in a pan with the butter and 2 tbsp of water. Cook over low heat for 15-20 minutes until all the liquid is absorbed and the apples are soft. Let cool slightly then stir in the Dulce de Leche. Preheat oven to 350F (180C) and grease a 6-hole muffin pan. Roll out the dough slightly and cut out six 5-inch (12cm) circles and six 2-inch (5 cm) circles. Press the large circles into the muffin cups and fill them with apple dulce de leche mixture. Top with small pastry circles and seal the brims with your fingers. Brush the tops with water and sprinkle brown sugar on top. Bake for about 30 minutes or until the pastry is golden brown. Let the Mini Apple Pies sit in the pan for 10 minutes, then turn out and serve with vanilla ice cream or whipped cream.